I recently had the occasion to read Orville Pierson’s book Highly Effective Networking: Meet the Right People and Get a Good Job, written in 2009 but pretty savvy about the use of current technology, which explains how much more effective a particular kind of networking (not social networking, not sales networking — work-search networking) is in finding better work than what you’re doing (or not doing) right now. Orville knows his stuff, and the book is full of sound ideas, some pretty obvious but often not followed in the struggle to land a better position. We’ve been indoctrinated to think of the process as entailing usually-humiliating rounds of want-ad/job board reading, applications, cover letters with résumés, phone calls, rejection letters, and interviews. Orville explains that the easiest (at least psychologically) and most effective way to find work with a desired employer is through networking. The objective, he says is to get the position through having met the Decision Maker, via the “strength of weak links” and a series of conversations with their contacts, before the job is even posted or perhaps before it is even considered. 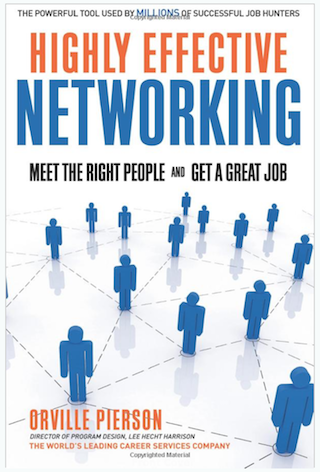 Networking as a job search technique, he says, is not about aggressively searching or selling yourself or asking for jobs; it’s about getting your name, reputation and credentials in front of potential Decision Makers through having low-stress, authentic, comfortable conversations about common interests that have reciprocal information exchange value to each person you speak with. Your search will be more effective if the large majority of your time is spent planning and in direct conversations, rather than doing secondary research in front of a computer screen. It will also help if you have a few ‘personal coaches/confidantes’ (can be anyone you trust who knows you) to use as sounding boards in each of the following steps, and to talk with about anything negative you encounter or feel (keep the negatives out of your search conversations). The book is IMO a bit wordy and cute (in the sense of superficially clever), and the process is described three times in increasing order of detail, which I found confusing. Here’s a summary that I think captures the essential steps in the process, dense but delayered. Step 1: Decide to find your next job via networking rather than other methods (replying to ads, using recruiters, walk-ins, direct mail, applications, cold calling etc). This means most of your energies will be spent on networking activities often with no immediate obvious payback, rather than those other methods. Step 2: Map your Personal Contacts network (basically everyone you know that you have a significant current or past relationship and/or known shared interests with, “anyone who would readily take your phone call”). Think about all your possible networks — organizations, interests, educational institutions, clients, employers, vendors, political, community, charity, sports, hobbies, professional associations, friends, family, neighbours etc. Identify those who are Active (regularly meet or talk with), Dormant (once close but not in a while), and Passive (distant connection enough to know your name or at least probably be able to recall you if you tell them what your connection is). Think about how you might start each call, to quickly help them place you if necessary when you call them. On that basis assess the strength of each Personal Contact in your total contact, and start your calls (step 6) with the strongest (easiest). Call Passive contacts only if there are continuing shared interests/relationships or if you think these “weak links” may have strong connections of their own relevant to your search. Step 3: Plan your search and network activities. Identify your Professional Objectives (what kind of work do you want to do), your Target Market (what kind of organization do you want to work with) and your Core Message (why you are so well qualified for work that meets your Professional Objectives in organizations in your Target Market, put in words your Target Market can relate to). 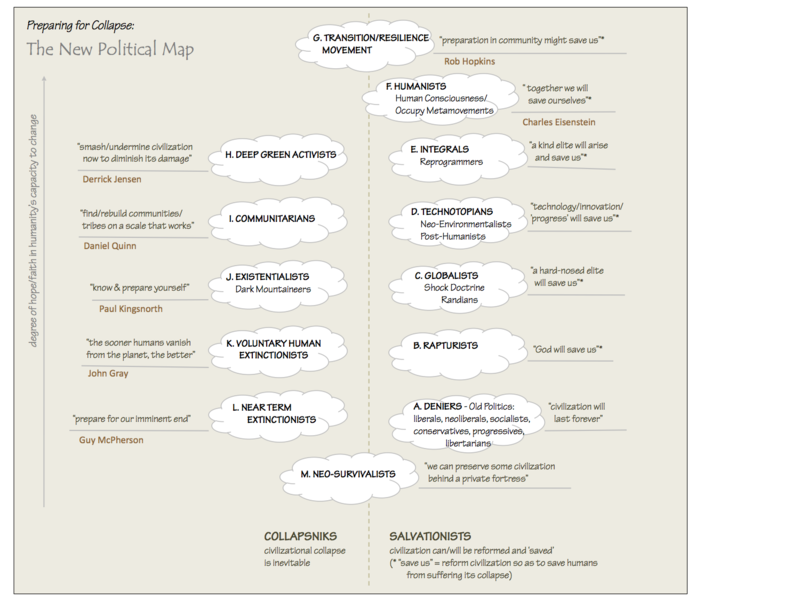 Step 5: Identify possible Decision Makers in your Target Organizations. If possible (using online research or asking people) identify who might be in their networks, to see if you have any in common. In large organizations the Decision Makers are usually not C-suite people; they are the people with the strongest voice in who gets hired at your level. Step 6: Get the word out to your Personal Contacts. Let everyone (identified in Step 2) know that you’re available and looking, and what you have to offer. Make them comfortable* with an amiable and authentic introduction and update — don’t rush into your request or “ask for 20 minutes of their time”. Once you’ve established or re-established rapport, ask if they have ideas about your search, and show them your Target Organizations list. Ask if they know others who might help refine your list or your search (Secondary Contacts), or if they know other potential Target Organizations to consider for your list, and if they have comments about or know anything about your Target Organizations, and most importantly (and when appropriate) if they know anyone in your Target Organizations (Professional Contacts), and if they’d be comfortable introducing those people to you (not just giving you or emailing you the person’s name), and if they say Yes to both questions, add those others to your network. You should plan to get at least one introduction to a new relevant contact for every two calls (and talk with your coach/confidantes if you’re not meeting this target). Step 7: Meet and exchange information with Secondary and Professional Contacts (people you already know in Target Organizations, plus “weak links” — people who have been recommended to you for help or information about your search, and people in your Target Organizations you have been offered an introduction to in Step 6). Ideally, the first Professional Contacts you meet in one of your Target Organizations will be insiders at or below your own level, working in areas that interest you or where you have strong competencies applicable to that organization. Inquire about the organization’s priorities, skill prerequisites and challenges. Keep it businesslike — avoid too much personal stuff, without being dishonest, and focus on your process and specifically your Professional Objectives and Core Message (don’t mention your Target Organizations list to Professional Contacts inside one of them). Learn from them what is going on in the organization, clarify who the Decision Makers might be and as much about them as you can. You should be able to talk with them as professional peers and offer information in return to reciprocate their time and energy. Give/send your resume, if appropriate, only at the end of your meeting or phone call. Step 9: Keep everyone informed about your progress. “Loop ahead” (re-contact past networking calls and bring them up to speed on how you’re doing, and see if they have more info or additional referrals). Contact any Decision Makers you’ve met every 2-3 weeks until they hire you; mention new information about the organization or people you’ve recently met in the organization. [More info in the book about managing your way through actual job interviews if they’re needed] And when you get the job, tell everyone and thank them. Step 10: Ancillary use of a website and social media. Use your website and professional sites like LinkedIn to articulate your credentials, character and reputation — and in your case to subtly clarify that you’re gainfully self-employed and hence looking for a job as a choice rather than out of desperation. Use social media and blogs sparingly and avoid online squabbles or arrogance. Have a Facebook page but it’s fine if it’s innocuous and just about your work. Use LinkedIn and other social media to identify people in Target Organizations but don’t contact them cold — gather information and use it in your networking conversations. Identify “friends of friends” who might be worthwhile adding to your networks, and identify who in your existing networks might introduce you. *Making your networking contact comfortable entails the following (1) “Manage their expectations. Tell them at the very outset what you have in mind and what your goals are in the conversation. Explain how you’re doing job hunting, and which steps you’re working on right now.” That will relieve concerns they may have that you’re looking for job openings or other guidance they may not feel qualified to give (and that they’ll be letting you down if they don’t), or that you’re going to press them for referrals or otherwise “put the squeeze” on them. It might help to have a short script to accomplish this upfront. (2) Always be honest and authentic. (3) Only accept an introduction to a new contact if you are convinced they are completely comfortable making the introduction. (4) Express gratitude for whatever they offer. The book contains several ‘scripts’ for making networking conversations with various types of contacts ‘comfortable’ — some are a bit unnatural but they do provide some good ideas on how to do this, more than I can capture in a summary. The process is somewhat iterative as your contacts and knowledge grow. As a former employer charged with interviewing and hiring professionals, it makes sense to me. No guarantee — I’ve known people who’ve used a process like this who I’ve bent over backwards to hire, and others who’ve used the same process that I wouldn’t hire (because I didn’t think they had the right skills for the job) despite their work-search savvy and perseverance. In short, this is a book worth reading if you’re at that point in your life, and I know a lot of people are. If you find the book, and/or the summary above, useful, let me know. Dave – the advice may be sound, yet my sticking point is probably on 3 – I have no clear idea what I want to do. My ideal is outside of “getting a great job” and being able to work in a pattern that suits me. I work in bursts and this doesn’t fit in well with a typical “work for this many hours in this interval of time each day”. There are probably books that talk about the sort of networking for being freelance, but when I look at this sort of career advice I realise I haven’t ended up with a career because I’ve be chasing the wrong paradigm based on social messages to seek steady and reliable employment, essentially “getting a good job” without a definition beyond it being tolerable, paying well and allowing one to live comfortably. Nathan: This gets back to the essential cognitive dissonance between the realization that “jobs” and “work” are abominations of our industrial capitalist “growth” culture (and in a better world need not exist at all), and the daily reality of trying to eat and live well in this ubiquitous culture. Perhaps I should have qualified the parenthesized definitions of Professional Objective and Target Market in step 3 with the words “If you accept that you really have to work for an organization…” For almost everyone I know, work is, or has been, the means to earn enough money to buy the time and resources to do things that are really important and useful.